Nice one Phil! Thanks for posting this. Very well written. I like this. Having over the course of the last 10 years dumped two high status, but unloved, jobs in an attempt to spend what remains of my life doing things I enjoy, rather than dashing around the country in a frenzy of guilt and anxiety, I'm entirely in favour of this approach. Looking back, I think the happiest time I've ever had was the 2.5 months I spent on South Water Cay in Belize, back in 1990, on a diving expedition. All I had with me was my dive kit, several pairs of shorts and T shirts, a personal stereo (as they were then called) with about 5 cassette tapes and a few good books. The relief of freedom from a great weight of possessions was quite fantastic! the difference between enjoying posessions and bing possessed by them. Good to see we're all such well adjusted people here! Hello Phil. Sorry to disprove the assumption in your comment that you have well-adjusted readers but I feel I ought to comment. I think your posting misses one point: status without anxiety. The tacit implication you make is that if someone seeks a particular status then some form of anxiety comes with that search. the impetus for contributing open source is, in large part, personal status. The status of those in the inner circle of the Linux kernel (committers), for example, is known and respected throughout the civilised world. However, I can't see any of the people I know getting into a pother with anxiety. They are the best, they have demonstrated that they are the best and have received the resulting status within their community. I work in the kernel group of an operating system company. The real gurus in that small group enjoy a status well above any normal mortals but, as far as I can tell and I work with the daily, don't feel any form of anxiety. They can do the job better than more-or-less anyone else in the world and are accorded the appropriate authority. So, I think "status" in your posting is something other than the "status" I see around me all day. I fly with excellent pilots who are accorded the appropriate status. I code alongside excellent programmers who are accorded the appropriate status. You say, "Beyond the basics .... many people are driven not by personal goals but by the craving for high social status, whether merited or not." Perhaps I have been abnormally lucky but I must say that I can't remember ever meeting any of them. Thinking back, I've recently met people driven to gain a better understanding of causality, to attack the Riemann hypothesis, to play Brahms' 3rd Violin Sonata, to reduce the interrupt latency on an embedded kernel, to put the Schubert quartets into their correct historical context and to determine exactly what happened on 28th May 1453 in the Hagia Sophia (yes, I'm in there somewhere). If successful, each of these would bring increased status within their peers. But I can't think of any anxiety involved. 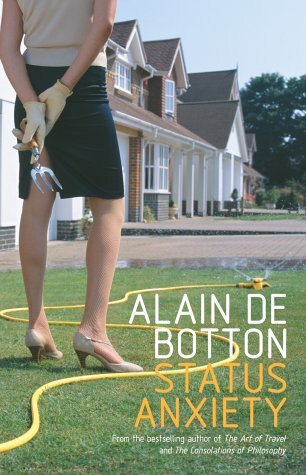 And, please do not start me on that old fraud, Alain de Botton. I am very much against book burning in general but perhaps the world would be a better (certainly a cleaner) place without his. Interesting points that lead us deeper into the nature of status, although I didn't think that I had implied that all quests to excel neccessarily lead to stress and anxiety. I was directing the post at the desire for status within society at large, and more particularly the craving for symbols of status - the venal rather than the spiritual. p.s.I reckon you're the Schubert man btw. Well done, Phil. That's what I've been trying to get across to Chris for the last couple of days. You have inspired quite a debate in our household! Pity you can't pop over just like that, but we shall keep the few beers in readiness for when you next cross the Atlantic. Then you could meet Elva too, who's another of your regular blog-followers. Chris wants to know if books come into the same category as plasma TVs (we still don't have a TV of any description), posh cars and the like. He's the Hagia Sophia man, btw. The Schubert expert was a girl we met.